I just finished (and adored) Dragon Age: Inquisition, along with the Jaws of Hakkon DLC, on Friday evening. 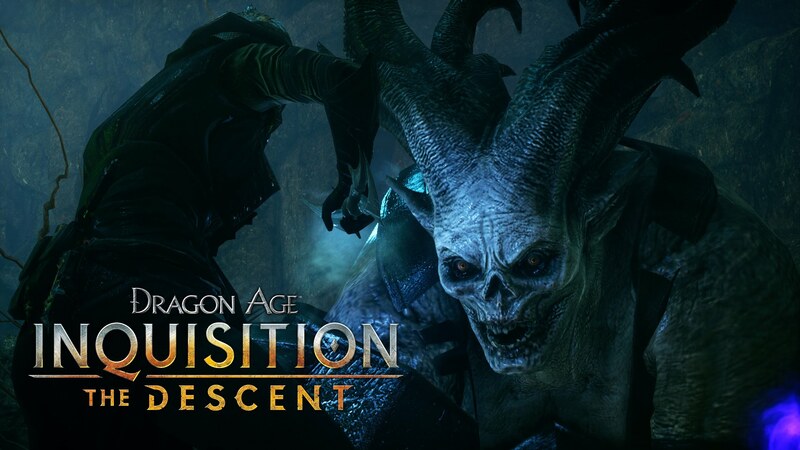 I was super excited for The Descent, because I’d been missing playing Dragon Age! I bought it right when I got home from work and I’ve just finished playing, so I wanted to give a quick overview. You will venture deep below the surface to discover the source of mysterious earthquakes threatening Thedas. Explore the legendary Deep Roads, but ensure that you come prepared. A perilous journey awaits underground, where vast, darkspawn-infested caverns will challenge the Inquisition like never before. Meet memorable new characters, learn more about dwarven history, and collect epic loot as you fight to solve one of Thedas’s greatest mysteries. Hidden danger lurks within the Stone, Inquisitor. Good luck! You start this DLC by sending one of your advisers on a war table mission, just like Jaws of Hakkon. You get to the Deep Roads and, obviously, there’s trouble brewing and only the Inquisition can help. Plus, if you don’t help, the lyrium supply might get cut off, which would be VERY BAD for everyone. The majority of your time (I would estimate 90%) in The Descent is spent in combat, and (if you’re playing post-game), very tough combat at that, since enemies scale to your level. I was level 27 at this point, so everyone had approximately 932874294 hit points. Give or take. I shudder to think how long battles would have taken if I was on anything higher than casual difficulty. Yeesh. The two new characters are fun to meet, but we don’t get to know them very well. I do wonder if a dwarf Inquisitor would have been able to contribute more, or how it would be different for them; my human was out of her element, and Varric still doesn’t like the Deep Roads (understandably). I also brought Dorian and Iron Bull along; Iron Bull had the least to say of the three. If you bring Dorian, you get a sly reference to the Mass Effect elevators, but the elevators in this DLC are a thousand times worse, so it might have been better if they didn’t point that out. The lore bombs dropped at the end were super interesting, especially if you’re like me and eat lore like candy, but I don’t know that they were worth the $15, especially since it only took me around four hours to finish. There are side quests, of course, but they’re really just ‘find this gear’ and ‘find this cup’ and ‘find these journal pages that are inexplicably scattered around.’ That was fine in the main game, since you have so much else going on to break it up, but in this it particularly stood out. Ultimately, I think you should wait for a sale on this one – I wish I had. You can get The Descent on Origin, Xbox One, and PS4 for $14.99. P.S – There’s a Towers of Hanoi puzzle. It finally made its way into Dragon Age lore.